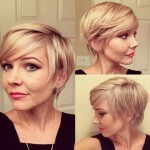 Home » Popular Hairstyles » Summer Hairstyle Ideas: Ultra-Chic & Shaggy – The ‘Rebel Pixie’ Cut! 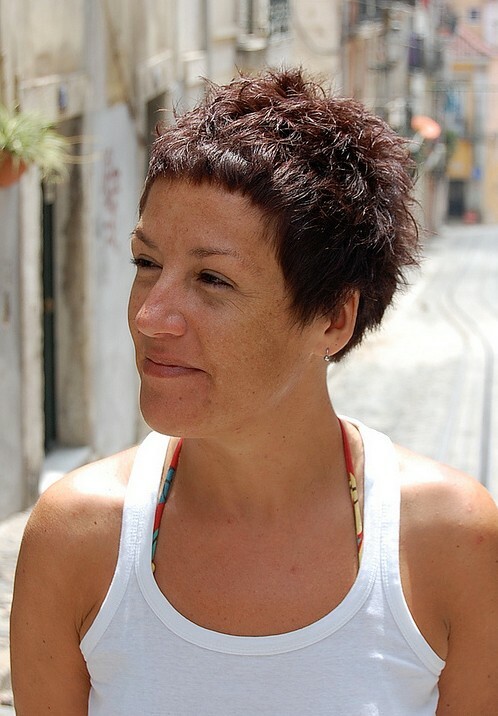 Trendy stylish boyish short red pixie cut for mature ladies: The short razored Pixie style is given lots of trendy edge in Cedric’s cut for a rebellious pixie! 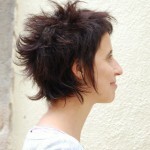 The back was razor cut into short, strongly textured layers. Then the nape was beautifully shaped from behind the ears, swooping down into a long, soft V-shape which provides an attractive contrast with the spiky styling. The roughly tousled short back layers continue up and over the crown creating a lovely, circular profile, broken by the lightly shaggy outline. The sides were also cut into short textured layers, brushed forwards to cover the top of the ears and provide a textured, uneven line softening the hairline. The fringe was cut very short from a casual side parting then waxed and lightly tousled with forward movement on the top of the head. And the final touch of genius to Cedric’s edgy, new take on the pixie cut is the expertly graduated fringe above the temples making a pretty oval shape to frame the face. This fantastic naughty pixie style has a perfectly balanced blend of curves, circles and spiky, trendy style! This is a good short haircut for Sports & Activities. Find more short hairstyles for women here.